Catherine Bogart Rankin (1857-1948) was the great-granddaughter of Cherry Hill's first occupants, Philip (1747-1798) and Maria (1749-1830) Van Rensselaer. Rendered a “half orphan” upon the death of her mother in 1860 and essentially abandoned by her father, Catherine was raised at Cherry Hill, per her mother's dying wish, by her older cousin, Harriet Maria Van Rensselaer Elmendorf (1816-1896). By the time Catherine was coming of age, the finances of the Cherry Hill family had so declined that Harriet Maria was forced to put the family estate on the auction block—and in 1884, Catherine faced the loss of the only home she had ever known. Catherine's own circumstances were redeemed by her marriage to a rising lawyer, Edward Rankin (1850-1932)—and she thereafter made her life's mission to regain Cherry Hill and to restore it—along with her family legacy—to its proper glory. Equally motivated by a love for her family heritage and by a design movement called the Colonial Revival, at Cherry Hill, Catherine recreated an idealized vision of her colonial home. She decorated primarily with “antiques,” using ceramics and textiles—and sometimes floral arrangements sourced from the garden— in careful color schemes and room arrangements. 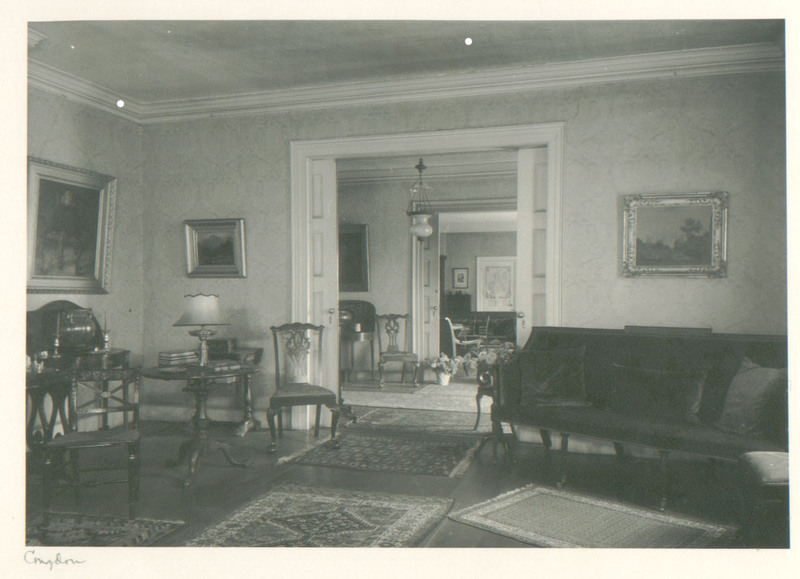 But Catherine had an “edge” on most followers of the Colonial Revival in that she was not merely decorating with “colonial” pieces or reproductions of them—she decorated with family pieces displayed in her ancestral home—both of which legitimized her family's elite status. Catherine had her work cut out for her in restoring Cherry Hill. Many of the house's prized possessions had left with Harriet Maria and her daughter, Hattie, when they moved away. Catherine worked indefatigably to bring family pieces “home” to Cherry Hill. She bought furnishings back from her relatives who were still struggling financially—rescuing the family treasures from being sold to pawn shops and dispersed. In some cases, Catherine reproduced ancestral items that she was unable to acquire, that had been broken, or that she simply loved. She also altered pieces, electrifying oil lamps or adding decorative flourishes to antique furniture. At the culmination of Catherine's Colonial Revival vision, her accomplishments were not only recognized by her peers among the “old families” but by collectors and curators across America. But Cherry Hill was not merely a collection for Catherine. There, she cultivated an atmosphere of “refinement” and a reverence for an idealized past, which, to her mind, epitomized the true identity of America. While Catherine raised her children buttressed in this “atmosphere of unusual refinement,” industry and a working class neighborhood encroached on Cherry Hill's fence line. And dramatic change in American culture encroached on their values. 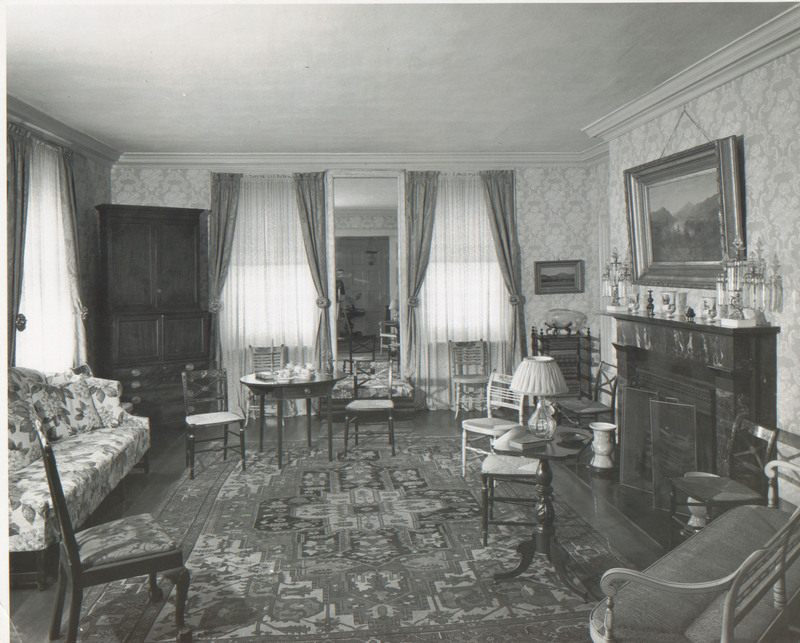 "Those rooms do represent an earlier life, and they present it in their finest possible manner. The viewers, however, will see more. They will become conscious of the best of the past in design, in sound craftsmanship, in proportion, in civilized living. The excellence which they see can only enrich and inspire them as individuals. Rooms as those from Cherry Hill must be a force toward higher community standards." The contents of the “memorial” rooms have been returned to Cherry Hill on long-term loan and can be seen during regular tours. 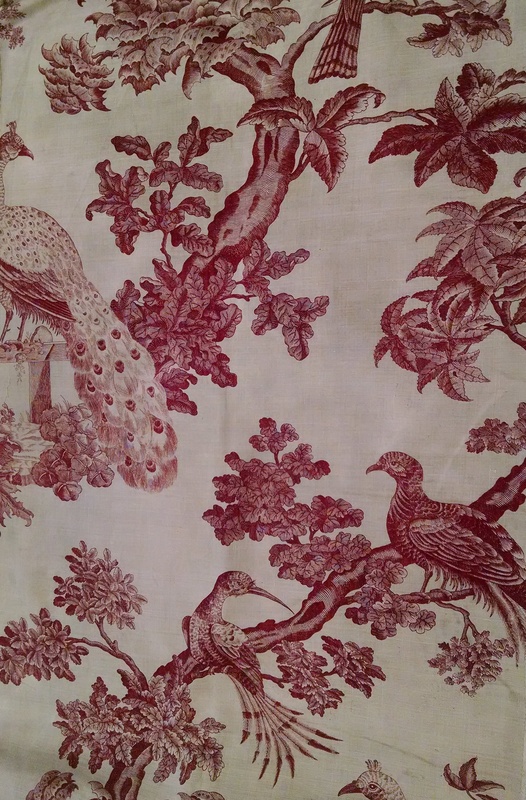 These copperplate printed textiles likely descended in the Cherry Hill household from the time of Philip Van Rensselaer, Cherry Hill's first owner. Philip was a merchant known to import such textiles from England and France. Apparent alterations and a tag that reads “Emily W. Rankin” evince their continued use by the Rankins. 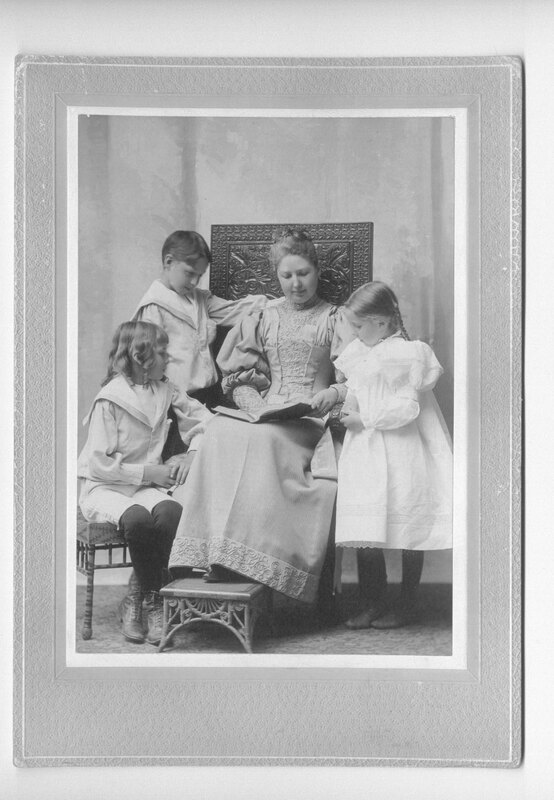 Catherine is seated surrounded by her children: Edward Elmendorf Rankin (1885-1961), upper left; Herbert Edward Rankin (1887-1917), lower left; and Emily Watkinson Rankin (1889-1963), right. 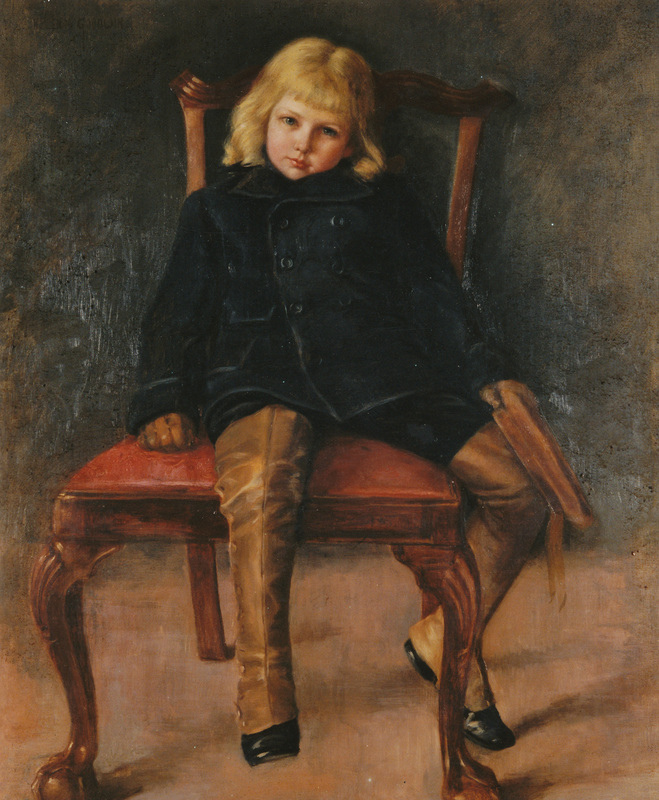 This painting by Albany artist Helen Goodwin depicts seven-year-old Herbert Rankin seated in the chair that once belonged to his great-great grandfather, Philip Van Rensselaer (1747-1798). This painting can be seen to represent all that was dear to Catherine Rankin. The chair, Herbert's outfit, and his curls remain in the Historic Cherry Hill collection. Although the Rankins of Cherry Hill primarily valued their own family's historical artifacts and decorative arts, they did also collect contemporary art pottery—which, with its emphasis on honest craftsmanship and old traditions, shared some of the ethos of the Colonial Revival movement. 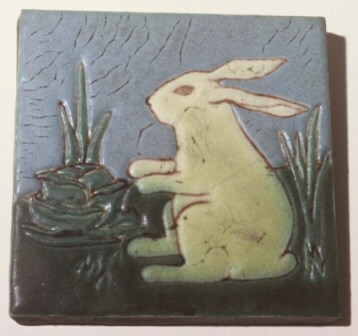 This tile may have had special appeal because Elmendorf, Herbert, and Emily kept rabbits as children. 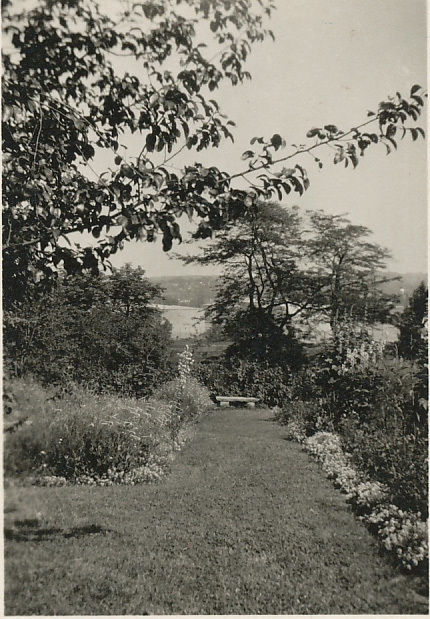 The Ten Broeck Chapter of the United States Daughters of 1812 noted, “ ‘Cherry Hill’ seems a spiritual presence, maintaining still the dignity, sincerity and beauty of an earlier day, while modern life of a commonplace and unlovely type surges round it.” For Emily Rankin, the sanctuary from modern day “unlovliness” was her garden. While her mother's focus was the house and family collection, Emily extended the Cherry Hill refuge to its fence line—a haven that stood in stark contrast to the surrounding industrial development and working class neighborhood. What did the encroaching neighborhood look like to the Rankin children? 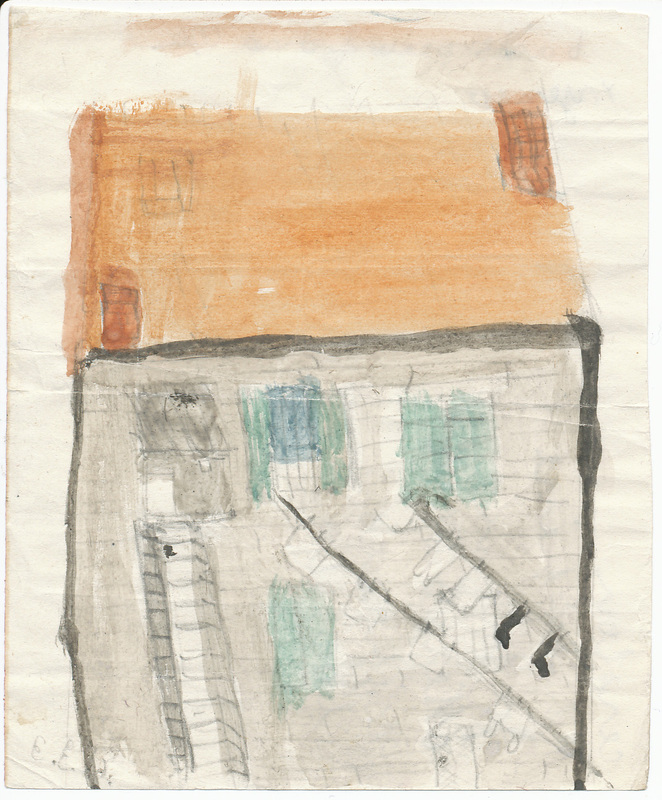 A young Edward Elmendorf Rankin (“Elmendorf”) painted this picture, labeled on the reverse, “back view of First Ave. House,” and signed “E.E.R.” in the lower left corner. A clothes line hanging socks and other items of laundry extends from the windows. Elmendorf's father was known to complain about the immigrant neighbors affixing their clothes lines to the Cherry Hill fence. The elaborate imaginative play of the Rankin children is extraordinarily revealing of their educational and social grooming. Upon acquisition of a pair of rabbits in 1897, the children commenced the “Bunnie Society.” What began as a club quickly became a royal kingdom ruled by “Mama Papa Bunnie,” who quickly populated their kingdom with a succession of litters. The Bunnie Society became a republic after a bloodless coup in 1898—there was a Declaration of Independence, and Mama and Papa's son, Kleine, became the first president. 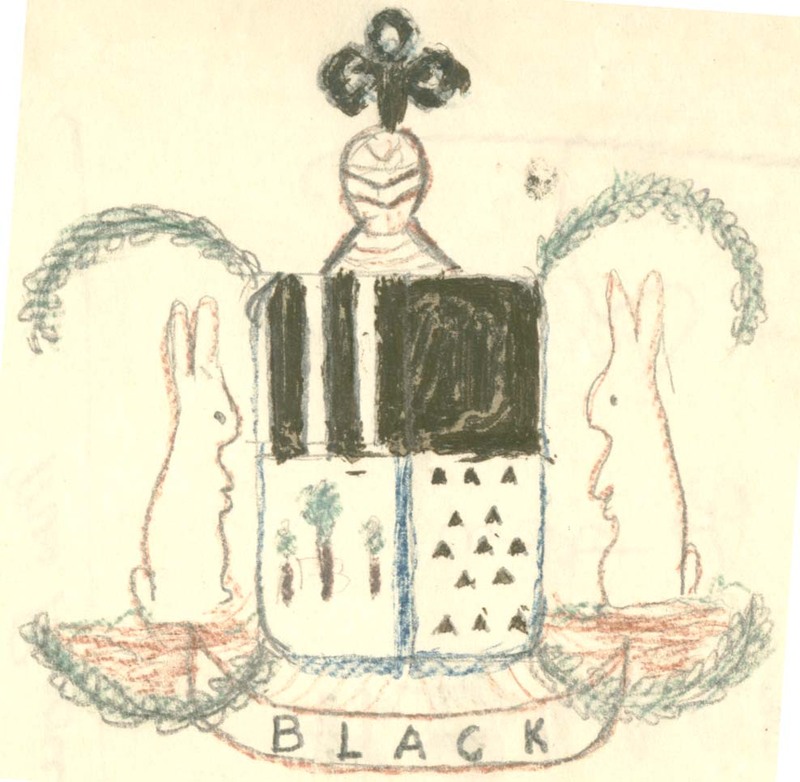 The children nonetheless retained a strong emphasis on lineage: they created charts representing the genealogy of the Bunnie line, betimes worried about the health of the “race,” and created a Bunnie coat of arms. Famous for his illustrations of beautiful women—known as “Harrison Fisher Girls”—it is not surprising that Fisher should take the Red Cross nurse as his muse in the creation of World War I poster illustrations. 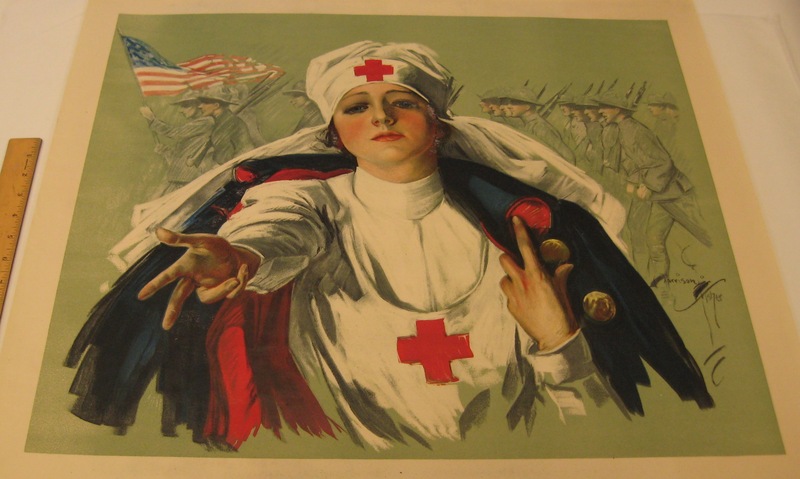 The Red Cross enrolled 29,000 nurses during the war, and they were broadly recognized and romanticized as heroines. Historic Cherry Hill's collection includes dozens of World War I posters. While it is not known just who collected these posters, it is certain that the Rankins took an active interest in the war. Herbert Rankin was commissioned a Captain in the United States Coast Artillery Anti-Aircraft Battalion, and his sister, Emily Rankin, served in the Red Cross. The collection includes Herbert's uniform, trunks, artillery notebook, canteen, and mess kit and Emily's Red Cross cap and pin. 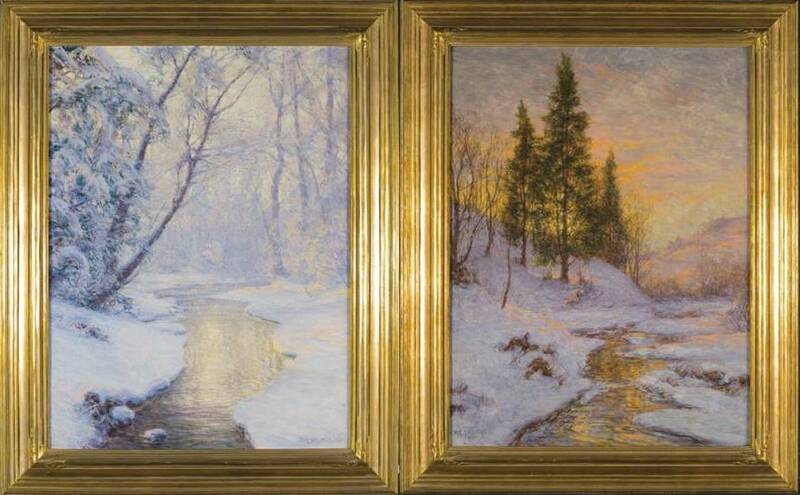 Catherine Rankin commissioned these winter scenes, “Voorheesville Creek” (left) and “Cedars” (right) in memory of her son, Herbert Rankin, who died during World War I. Like many of their contemporaries, the Rankins took refuge in the outdoors and spent considerable leisure time in the Adirondacks. Walter Launt Palmer was the son of noted Albany sculptor, Erastus Palmer, and a recognized American Impressionist in his own right. “Voorheesville Creek” was the last painting listed in Palmer's account book just a few months before his death. Emily attended the prominent women's college, Smith, during the era when debate about woman suffrage raged. Her classmates fell into both the pro- and anti-suffrage camps. Emily, perhaps predictably, fell with the conservative view and even served as the Recording Secretary for the Albany Anti-Suffrage Society. 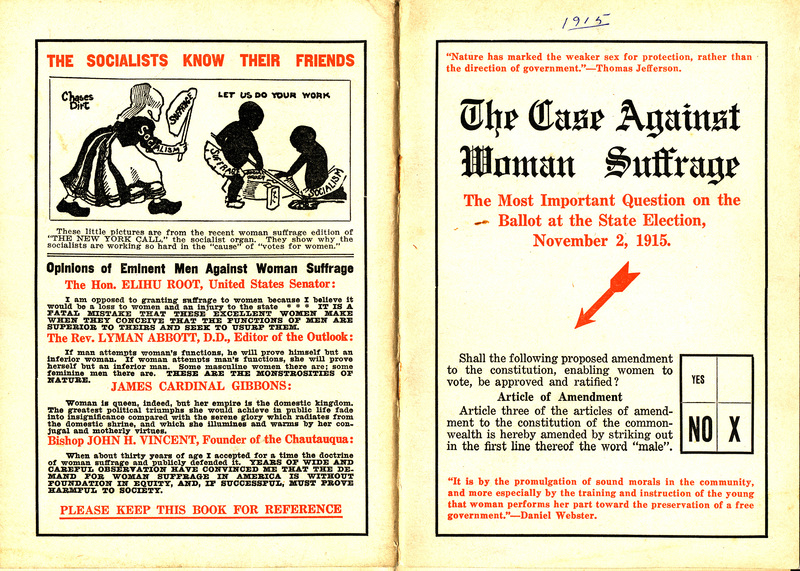 This pamphlet outlines the major arguments against granting women the right to vote. Suffragists are demonized as being socialists, unfeminine, and anti-family.